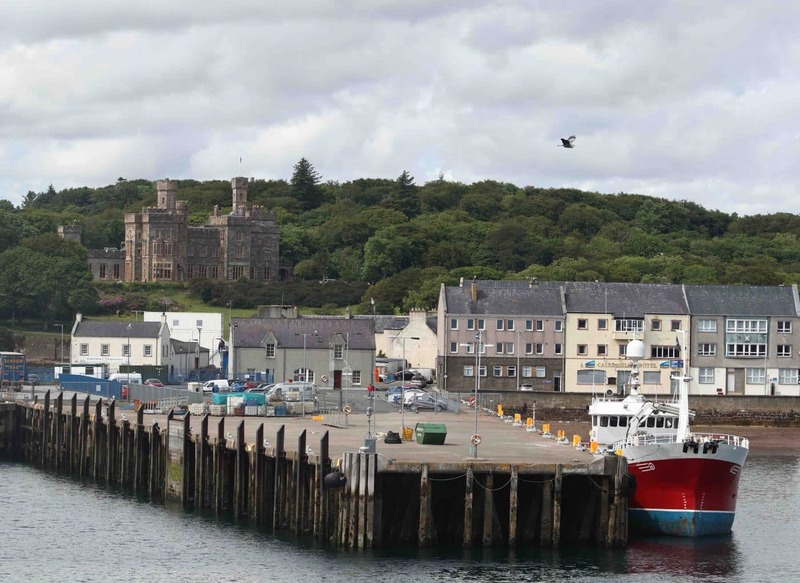 Not having travelled by ferry on Scottish waters since a bad experience many (many!) 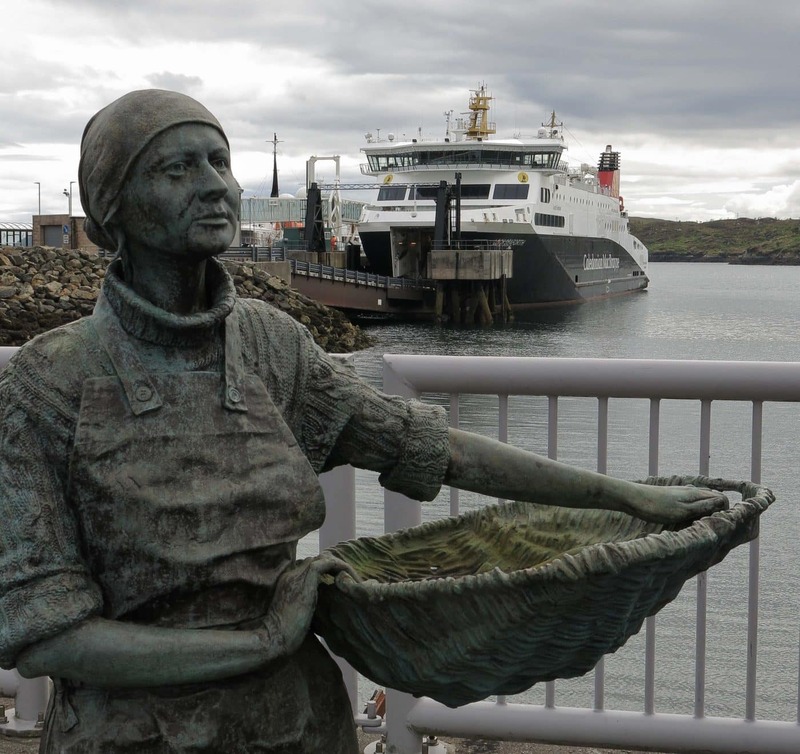 years ago I was a bit nervous about the Field Club’s outing on 16th June 2018; a day trip from Ullapool to Stornoway on Lewis aboard Cal-Mac’s new vessel the MV Loch Seaforth. The aim was to look for birds and cetaceans which would mean me using binoculars from a moving platform, a recipe for disaster! I survived and the trip was really enjoyable. Avril and I were joined by twelve others, mostly visitors, who had seen the event advertised; six nationalities were represented, which made for lively conversation. The weather on the outward journey was wet for the first 90 minutes or so but the rain did stop and we could then watch from the uppermost stern deck. Results quickly followed with Harbour Porpoise (Phocoena phocoena) seen at both sides of the ferry and then a small pod of Common Dolphins (Delphinus delphis) soon after. The dolphins appeared from nowhere off the starboard bow and looked like they were going to cross our path; next thing they were travelling along side us only a few meters from the ship. This was the first time Avril and I had seen cetaceans from a boat, we normally see them from Stoer Lighthouse while ‘Shorewatching’ as volunteers for Whale and Dolphin Conservation. It was magical and, for a few seconds, we got an intimate sense of their mastery of the sea. Then they disappeared as quickly as they had appeared. Two and a half hours after leaving Ullapool we landed at Stornoway; a chance to return to dry land for two hours and safely have something to eat! It was the uppermost stern deck from the start of the homeward journey as the sun was breaking through and the visibility had greatly improved. We could now start to look seriously for birds and recorded Common Tern (Sterna hirundo) before leaving the harbour as they flew around us looking for food churned up by the ship’s propellors. We recorded a total of 19 bird species from the ferry including Manx Shearwater (Puffinus puffinus) and European Storm-Petrel (Hydrobates pelagicus). We had hoped to see these two species as a project started by the RSPB in 2014 to eradicate the invasive non-native black rats from the Shiant Isles had been declared a successes in March of this year. The rats were known to consume the eggs and chicks of the islands’ breeding seabirds and their presence was also very likely to be discouraging other species like the Manx Shearwater and European Storm Petrel from breeding there. The Shiants are one of the most important breeding colonies for seabirds in Europe with around 10% of UK puffins and 7% of UK razorbills breeding there every year. 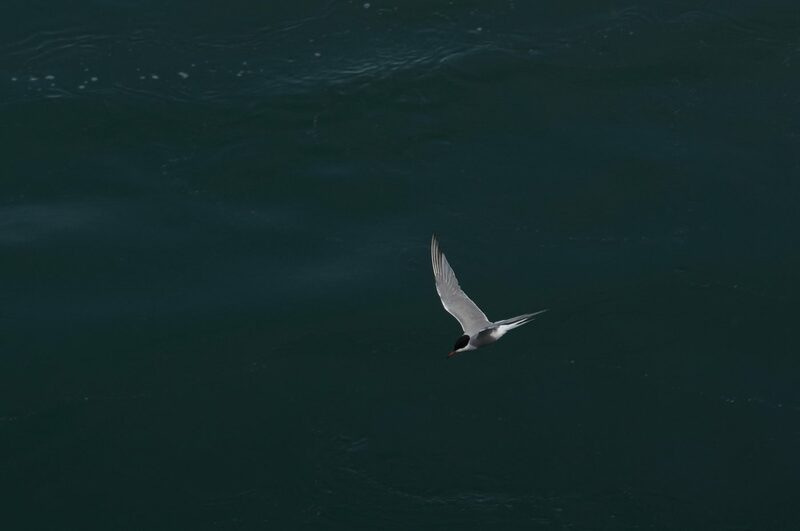 The second part of this project was to encourage the shearwaters and storm petrels to breed on the islands and in the summer of 2017 calling storm petrels were recorded on the islands for the first time. So, fingers crossed that more birds will now have greater breeding success on the Shiants. A few other birds recorded were Puffin (Fratercula arctica), Gannet (Morus bassanus), Red-throated Diver (Gavia stellata) and Black Guillemot (Cepphus grylle); all of which we can see in/from Assynt but to see them far out at sea was again very special. Harbour Porpoise and Common Dolphin were again recorded on the homeward journey with a pod of five porpoise and a very active pod of c20 dolphins causing lots of excitement, and transfer of weight on the ship! The rain did get us again as we approached Ullapool but we needed a seat by then anyway having just walked all the way from Stornoway! So all-in-all a superb day out in great company and well worth doing. Shag; Cormorant; Great Skua; Herring Gull; Great Black-backed Gull; Kittiwake; Guillemot; Razorbill; Puffin; Black Guillemot; Red-throated Diver; Fulmar; Gannet; Common Tern; Manx Shearwater; Storm-Petrel; Oystercatcher; Hooded Crow; Wren; Chaffinch; Goldfinch; Grey Heron; Mallard; Red-breasted Merganser.